< New PEPperCHIP® Lupus Microarray available! 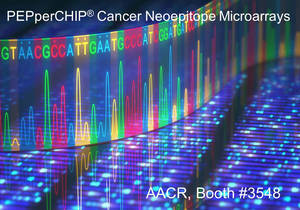 We invite you to meet us at the AACR Annual Meeting 2017 on April 1-5, 2017 in the exhibition area at booth #3548 in Washington, D.C.
At the AACR, PEPperPRINT will introduce the new PEPperCHIP® Cancer Neoepitope Microarray for the fingerprint analysis of cancer antibody responses against tumor neoepitopes. Join our representative Carsten Haber at booth #3548 to learn more about our solutions for cancer research, and particularly about our new PEPperCHIP® Cancer Neoepitope Microarrays.